Then why do I have coffee all through the keyboard and over the screen? You have love this group! It has been a long time, MacD, since we have had a description that stirs so much imagination! Yer right MacD...That, absolutely, was not funny. tea on my keyboard you horrible man you!!!! we call it the Mt Somers Haka when the wasps start pinging you in the legs looks as funny as heck but not much fun if you are the one "dancing". 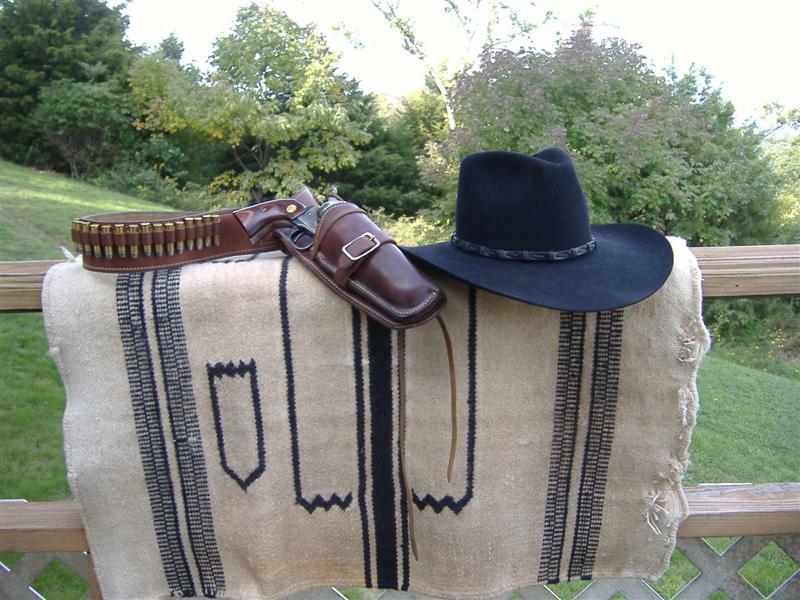 Here is my rig for Cowboy Action Shooting. 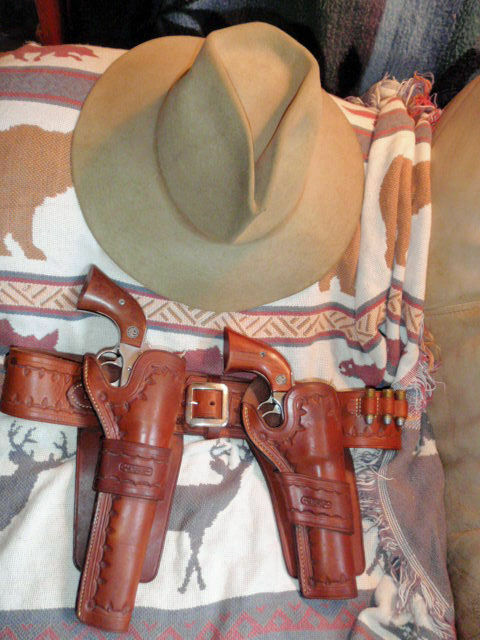 Ruger Vaqueros in .45 Colt and a well worn Stetson. very nice, and is that your poncho its resting on??? Nice rig. I have thought about a cross draw for the second gun. Ok, Pkslinger, how do you draw a pistol with that long a barrel. I'm not sure my arms are long enough. Definitely not going to win any fast draw competisions with that long a barrel. Badass Stets. Like the matching strong/cross rigs too...that's a touch of class for sure. THAT IS A "STETSON". Not a "Stets" thank you very much. And a very nice one at that. SPELLING NAZI TO THE FRONT OF THE LINE PLEASE CODE BLUE WOOP WOOP! Not to rain on Pumpkinslinger's parade (Very NICE rig). More into raining on Stovey's parade. First one is my everyday rig. 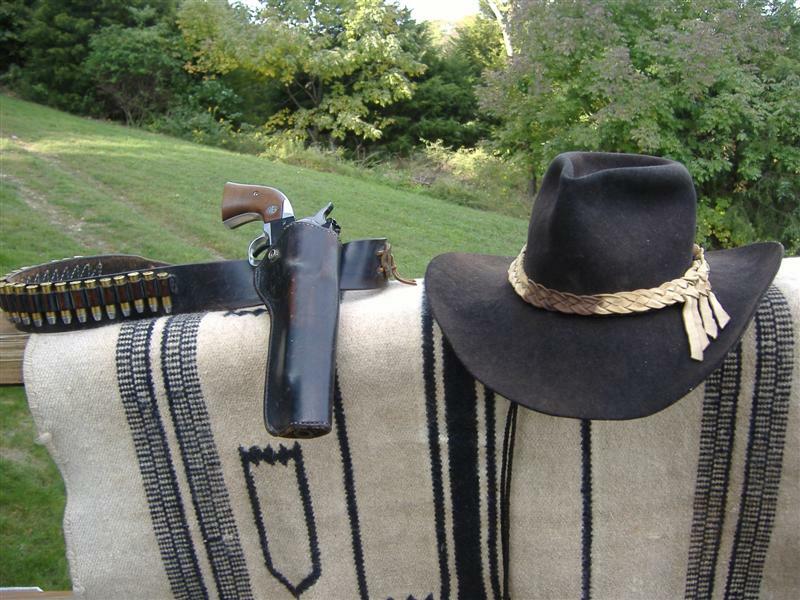 The gun: Ruger Blackhawk. Leather: Bianchi Lawman. The hat: Bailey. The second one is my Sunday go to meeting rig. The gun: Colt SAA. The Leather: George Lawrence. The hat: STETSON. I like Punkins rig better. Like his hat better too.